To empty the contents simply remove the top and pour the contents away. A quality lightwieht and portable 4 litre extraction pump suitable for many applications including inaccessible areas and is also able remove fluid direct from the ground. 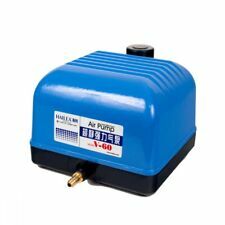 1 x Hailea V60 10 Way Air Pump. 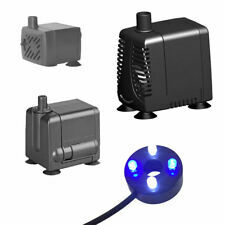 V60 Air Pump 10 outlet - 60 litre of air per minute, 35 watt power consumption. PUMP SPEC - 60 LITRE/MIN. - WEIGHT = 5.6 KG. Size of 20mm at high speed. It can be used in various water bodies including ponds, pools and flooded areas. Part of the design is a level switch which enables the product to be operated automatically as well as avoiding dry running of the pump. Antrieb: Bürstenlos, magnetisch, 2-Phasen. Diese 350mAh starke 12V Wasserpumpe kann auch mit solar betrieben werden und arbeitet mit Wasser, Öl, Benzin. Verwendbare Substanzen: Wasser, Öl, Benzin. Ist vollständig Wasserfest und somit als Tauchpumpe geeignet. The spindle goes into the chuck of an electric drill which serves as the power unit. Don't allow the pump to run dry of liquid as it will quickly overheat and fail if it's just trying to pump air. Float switch. Max flow rate 10000ltr/hr. Power: 400W. Accepts floating solids to maximum of 35mm dia. Hose connection: 25-35mm. Minimum water level: 40mm. Maximum water temp: 35˚C. Das Pumpenset ist gut geeignet für kleine Teiche bis ca. 1500 Liter. 0 Watt/ 9Volt Solar Teichpumpe "Palermo" mit Trockenlaufschutz incl. Zubehör & Modulhalterung für kleine Teiche bis ca. 1500 Liter. Geeignet für Teiche bis 2500 Liter. 10 Watt Solarpumpenset "Water Splash 610" mit elektronischer Pumpe, Modulhalterung, Filterbox incl. Komplettset 10 Watt Solar Pumpensystem Watersplash 610. Sehr hochwertiges Pumpensystem für den Einsatz vom kleinen bis mittleren Gartenteich. 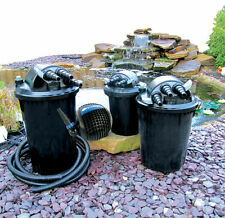 This pump is ideal powering water features and or external pond filters. Pump case Outlet size 3/4” BSP threaded connector. Efficient high performance pump designed for continuous use. 230 Volt operation. Düsensatz: 4 Steigrohre mit 61 mm Länge. Schlauchanschluss: 8,5 oder 10,5 mm. 20 Watt/ 9Volt Solar Teichpumpe "RIMINI" mit Filtergehäuse incl. Zubehör & Modulhalterung. Jedes Solarmodul ist ein Unikat, deshalb kann die Solarzellen-Struktur anders aussehen als auf dem Foto. Float switch. Max flow rate 10000ltr/hr. Power: 250W. Accepts floating solids to maximum of 5mm dia. Hose connection: 13-32mm. When using the pump should be rested for 10 mins after each hours use. Aeration is also an energy efficient way to prevent your pond from freezing over during the harsh winter months. Increases circulation and oxygen levels. Das Pumpenset ist gut geeignet für kleine Teiche bis ca. 1500 Liter. 20 Watt/ 9Volt Solar Teichpumpe "Palermo" mit Trockenlaufschutz incl. Zubehör & Modulhalterung für kleine Teiche bis ca. 1500 Liter. The SunSun CW-110 Wavemaker circulation pump - fixed on the holder - can be swivelled by 45° in each direction. Also the outlet nozzle of the circulation pump enables a swivelling by 45° in each direction. Geeignet für kleine Teicheanlagen bis ca. 2000 Liter. Komplettset 20 Watt Solar Pumpensystem Watersplash 470. Sehr hochwertiges Pumpensystem für den Einsatz vom kleinen bis mittleren Gartenteich. Steckerfertiges System inkl. Blagdon Affinity Waterfall (1051217). As such, we have a huge wealth of experience in online trading. At present we list nearly 5,000 specialist aquarium & pet products suitable for Aquatic, Reptile, Cat and Dog enthusiasts. Here you have Oase Aquarius Universal Classic 600 water feature pump. The boxes have got damp as can be seen in one of the photos but this has not, and will not, affect the pump. THIS IS FOR A SECOH EL PUMP ONLY! EL60 / EL60C. For servicing BOTH heads of a twin head pump you need 2x of these kits. 24/7 Free Technical Support. Kit contains EL100 / EL100C. WHY BUY FROM WE BUILD IT LTD??. Pond Boss PW1250 1250 GPH Waterfall Pump with Pump Barrier Bag NEW !! !